La Mancellière is situated at the end of a quiet, country lane and is a five minute walk from the pretty rural village of Buais with its beautiful, historic church. Here you can also find a traditional patisserie with freshly baked bread and delicious pastries, a butchers shop and convenience store. There is also a bar/tabac with a tasty lunch menu serving good beer and regional wine and cider. There are free tennis courts in the village and lots of outdoor pursuits such as horse riding, kayaking, cycling and fishing in the local area. Ten minutes by car and you are in St. Hilaire du Harcouët, a bustling market town with one of the largest weekly markets in Normandy. Each Wednesday at around 9am, the streets around the main square are closed to traffic with over a hundred stalls selling everything from fruit and veg, seafood and local cheeses to horses, dogs and tractors. St. Hilaire also has a large swimming complex, tourist office with English-speaking staff, great bars and restaurants and several large supermarkets. Mont Saint Michel is a rocky tidal island and abbey just off the coast of Normandy. The first church on the site was built in the 8th century and the current monastery and its famous bay are depicted in the Bayeux tapestry. Over the years, the island stronghold has seen many wars, downfalls and repeated assaults, including a failed siege by the English in 1423. It was turned into a prison during the French Revolution but this closed down in 1863 after many influential figures campaigned to make it a national monument. Mont Saint Michel was granted World Heritage status in 1979 and the stunning abbey can be seen from many vantage points along the coast of Normandy and Brittany. However, the mount is best experienced up close and personal where the incredible architecture and fabulous views make for a truly memorable day for all the family. 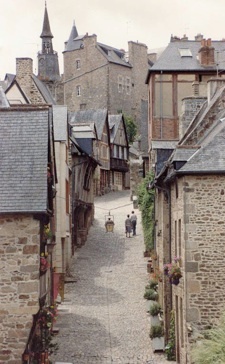 Mont Saint Michel is a 40 minute drive from La Mancellière. The Rance estuary flows down from the seaside at Dinard and cuts its way inland to the medieval town of Dinan. The main city is perched on a hill and is a perfectly-preserved 14th century town with wood-pannelled buildings and winding cobbled streets. At the foot of the hillside is a port with excellent seafood cafes and restaurants overlooking the boats and long winding roads wending their way upwards into the old town. Dinan is a great place to enjoy lunch by the water and potter around the shops in the afternoon. Dinard is often referred to as the Cannes of the north and has played host to many holidaying artists and dignitaries including Picasso, Monet and Winston Churchill. Its long promenade is reminiscent of British Victorian and Edwardian seaside resorts but you won’t find any “Kiss Me Quick” hats here. Dinard remains elegant and discreet and has its fair share of designer shops, art galleries and gourmet restaurants. Just an hour from the property and you can mooch around with vacationing Parisians and people-watch until your heart’s content. Alternatively, have lunch overlooking the prom in Dinard and then head to the nearby beach of Longchamp for some exhilarating surfing. The Enchanted Village of Bellefontaine is a fairy-tale amusement park that will delight younger children. There are rides, water slides, a skating rink and even a small petting zoo. Other attractions at the park include a pirate’s cove with a pirate ship and costumes for young swashbucklers, a fairy-tale valley featuring all the storybook favourites and a magic garden with a miniature village and waterfall. Geared towards younger kids, it makes a great day out for families and is only 30 minutes away. Alligator Bay reptile park near Mont Saint Michel is a fascinating and fun reptile reserve with more than 200 alligators and crocodiles on show. There is a dragon’s maze stocked with large boas, iguanas, chameleons and monitor lizards and a tortoise farm with giant specimens from the Seychelles and Africa. Just 40 minutes from La Mancellière, Alligator Bay is a fun day out for all the family. La Mancellière is just 40 minutes from Brittany’s spectacular Emerald coast with golden sandy beaches and turquoise seas. Most local beaches are quiet, secluded and spotlessly clean with some larger beaches offering kite surfing, sand-yachting and excellent surfing. 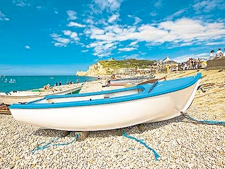 Seafood lovers can enjoy world-famous scallops, oysters, fish and mussels at port towns such as Cancale, which have fabulous views of the coastline. 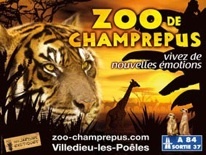 The Zoo de Champrepus is about 40 minutes from the house, close to the medieval town of Villedieu les Poêles. Here you will discover tropical rain forests, African plains and an area dedicated to the endangered species of Madagascar. After visiting the lions, cheetahs, antelope and rare Sumatran tigers, kids can get involved in lots of interactive activities and even help feed the lemurs and giraffes. 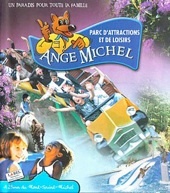 Take your kids for a splashing adventure at the Parc de Loisirs de L’Ange Michel. This brilliant water adventure park for kids (and adults) is only a 30 minute drive from the house. There are log flumes, huge water slides, splash pools, roller-coasters and tons of other activities for children of all ages. The park is set in beautiful landscaped gardens with picnic areas and a restaurant and bar area. Normandy is steeped in equestrian tradition and you will find lots of different types of horse riding for every level throughout the region. You can trek along beautiful sandy beaches, pack a picnic for a gentle hack through one of the many forests and even cross the shallow bay to Mont Saint Michel on horseback for an unforgettable experience. There are 250 kilometres of green routes in the region which are reserved solely for walkers, horses and horse-drawn vehicles. Just ask us for more details. A short drive south into neighbouring Brittany is the historic fortress town of Fougères, home to the largest medieval castle in Europe. More than a thousand years of history are packed into the quaint cobbled streets and winding roads of the beautiful old quarter where the imposing chateau and its formidable moat are never far from view. Fougères has captured the imagination of some of France’s greatest writers such as Victor Hugo and Balzac and when you wander the gardens and walls of this majestic site, it’s not hard to see why. Bagnoles is a pretty thermal spa town on the edge of the Andaine forest in the Orne region of Normandy. The town, popular with the European upper classes in the 1920s, retains much of its Belle-Epoque grandeur and the art deco cinema, casino and hotels blend seamlessly with medieval houses and ornate chateaux. The spa is set back from the lake and offers many luxurious beauty treatments and massages. The balcony of Les Thermes hotel is a wonderful spot for a post-facial lunch. If the men don’t fancy being pampered, Bagnoles golf course and club house are the perfect antidote. Saint-Malo, an infamous pirate city, was once a hotbed of smuggling, illegal trade, drinking and intrigue. The walled fortress would have kept unwelcome invaders out while protecting the booty within. Today Saint-Malo is a wonderful summer city with long stretches of golden sandy beaches surrounding the old walled town. Visitors can stroll along the walls for fabulous views across the bay to Dinard. There are lots of excellent restaurants, bars and shops or you can simply sit in a pavement cafe and watch the world go by. 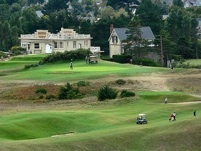 Normandy is home to 22 major golf courses, many of them ranked among the best in the world. The closest clubs to the property are the 18-hole, Yves Bureau-designed course at Garcelles, just south of Caen and Granville golf club, the only true links course in France just north of Granville at Bréville sur Mer. This well-loved course is a real challenge for many golfers, particularly when the wind whips up from the Saint Michel bay. 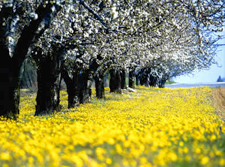 There are also many excellent courses to master in nearby Brittany and the Loire. No trip to Normandy is complete without a thorough introduction to Calvados, the region’s famed apple brandy. Calvados (or Calva as the locals call it) is double-distilled from more than 100 types of apple so there’s a lot of tasting to get through and, like most brandies, the longer it is aged the smoother the drink becomes. Usually quaffed as a potent digestif, Calvados is also served with a cooling sorbet to clear the palate between courses. Known as le trou Normand, this traditional method of consuming Calva is best approached sparingly or you may end up missing out on dessert. You can taste many different types of Calvados at most good wine cellars in the region or order a café Calva at the end of your meal and enjoy a large shot with a hot black coffee. The Manche region of Normandy has 250 kilometres of Voies Vertes (Green Routes) which take you deep into the heart of the countryside and are reserved solely for walkers, cyclists, horses and horse-drawn vehicles. The 36 trails lead you through rolling countryside far from the hustle and bustle of the towns and through woods and forests that are difficult, if not impossible, to access by car. All tours are signposted and graded according to difficulty and maps and brochures are available from tourist offices in the region. For those wanting to go off the beaten track, Manche Tourism has a list of safe unmarked routes that link to the basic network, allowing you to explore the area at your own pace. Forty percent of all line-caught salmon in France is taken from the rivers and lakes of the South Manche region. La Sélune river, just 15 minutes away, is one of the last salmon rivers in France and offers a rare opportunity to catch migratory salmon and brown trout. Tributaries of the Sélune top up the Roche Qui Boit and Vézins dams where you can fish for salmon, trout, pike and perch in stunning lakes carved out of solid granite. 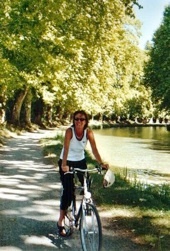 Other rivers nearby include the Sée, the Airon and the Cance. Fishing is permitted from early March until late September. Permits are available from local shops and tourist offices and equipment can be hired from tackle shops in the area. Please ask us for more details regarding permit prices and equipment hire. 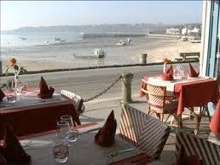 Less than an hour from the house is the famous fishing port of Cancale where seafood is always the dish of the day. Cancale has some of the best seafood in France and gourmet travellers can sample the town’s world-famous scallops, oysters, fish, lobster and mussels. Stop by at one of the many cafes for lunch and enjoy seafood platters, catch of the day or a simple plate of moules frites and a nice cold beer. Walk (or sleep) off lunch on one of the beautiful golden sandy beaches along this stretch of the Emerald Coast. We recommend Anse du Verger or Anse du Guesclin for the very best views and turquoise seas.